More than 5,000 species of dragonflies belong to the order Odonata -- the Greek word for “toothed one.” These expert fliers feature sharp, serrated teeth capable of devouring other insects at a rapid rate. In a 2011 Harvard study, a group of dragonflies caught 90 to 95 percent of prey in their enclosure. However, a dragonfly’s efficient hunting and feeding habits aren’t the only qualities that make it unique. 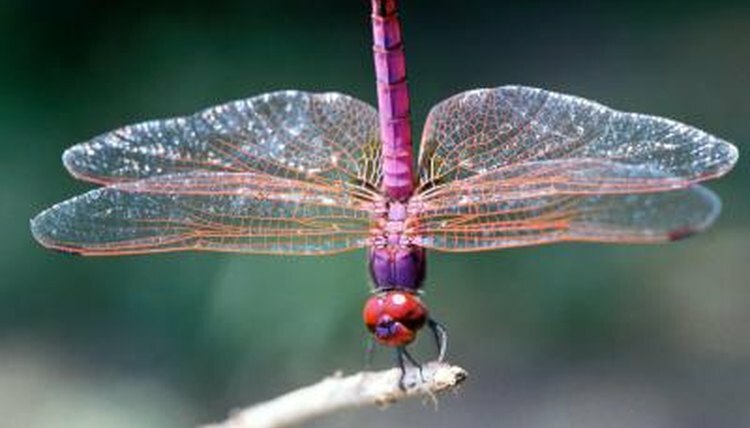 Dragonflies are true prehistoric animals; some species lived before dinosaurs even roamed the earth. Dragonflies evolved nearly 300 million years ago. Fossils from this time period show dragonflies with wingspans of 2 feet or more, much larger than the modern dragonfly’s 2- to 5-inch wingspan. A newborn dragonfly larva is called a nymph. Unlike their high-flying adult counterparts, nymphs do not take to the air. In fact, they don’t even have wings yet. Nymphs spend their time underwater breathing through gills and feeding on larvae, tadpoles and very small fish. As they grow, they begin to molt. The average nymph molts between 10 and 20 times, shedding its exoskeleton to reveal a larger body underneath. The final molting reveals a full-grown adult dragonfly complete with wings and a gaggle of eyes. Depending on the species, the nymph period can last from a few weeks to several years. Dragonflies have massive, compound eyes that allow them to see at almost every angle. Their eyes are composed of up to 30,000 individual lenses, endowing them with excellent vision not only for an insect, but for any animal. A dragonfly’s thin, transparent wings allow him to perform aerial functions similar to a helicopter. Dragonflies can fly backwards, forwards, change direction in a split second and hover for up to a minute. Dragonflies have the ability to beat their two pairs of wings simultaneously or singularly, making them expert fliers. Like many migratory birds, some dragonfly species fly south for the winter and northward when the weather warms. The globe skimmer dragonfly (Pantala flavescens) has the longest migration of any insect in the world; it travels 11,000 miles back and forth over the Indian Ocean.